Babe the Blue Ox greets visitors at Paul Bunyan's Cook Shanty. When I was a wee little girl back on the farm, we used to have the annual “Lumberjack Breakfast” at our elementary school. For one morning out of the year, we’d dress up in flannel shirts, don some old jeans, and enjoy a hearty breakfast of flapjacks, sausage and cold milk in tin mugs. Ok, I didn’t grow up on a farm. But, the rest of that was all true. When I went to Madison Elementary in Wauwatosa, Wis., each year we’d have a lumberjack breakfast for the entire school. Some of the PTA moms would get out their griddles (and these things must have been ginormous to feed all of us kids) and they would cook us up some great breakfast food. For some reason I remember a llama one year but I guess that means Babe the Blue Ox just wasn’t available for photo ops. Harking back to that earlier time of my childhood, we made the two-hour drive to Wisconsin Dells to enjoy their famous logging-camp style breakfast. For those of you not from the midwest, the Dells is like the Orlando of Wisconsin. It’s the waterpark capital of the US with a kitschy Main Street feel, old motels, Ripley’s Believe It or Not, stores that sell T-shirts for 20 for $10 and more. One of the best restaurants…er, attractions…in the Dells is Paul Bunyan’s Cook Shanty. Since the late 1950s, Paul Bunyan’s has been serving up family-style meals of great proportions to generations. The lines outside can’t be wrong. You’re greeted by an enormous parking lot with the line winding around the building. 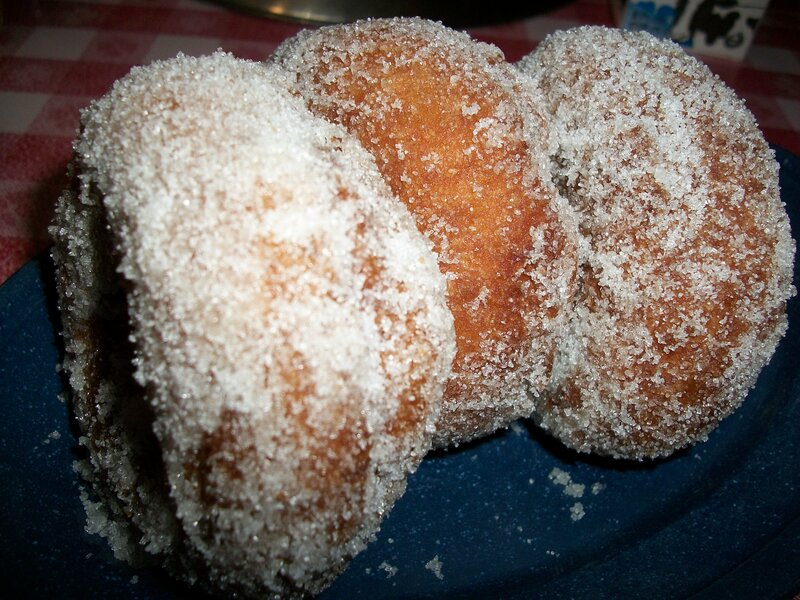 The sumptuous aroma of freshly baked buttermilk donuts slathered in sugar. The scattering of little feet trying to climb a huge Paul Bunyan statue. Screams of thrill and delight from riders from the nearby waterparks echo in the distance. You’re bound for a magical experience. Don’t be dismayed by the line. It moves fast. We waited for about 20 minutes at 9 a.m. on a Sunday morning during summer vacation. The breakfast bell rings from 7 a.m. to noon. Then, the Bunyan crew brings out the dinner menu until close. Diners sit at long wooden tables with benches. Old logging tools decorate the wooden rafters. There are three main dining areas to the shanty plus a gift shop that sells woodsy trinkets emblazoned with moose, bears and ducks. The breakfast at Paul Bunyan’s is $9.95 and is all-you-can-eat. You start with some of those sweet donuts, hot and fresh. They melt in your mouth and go great with a cold glass of moo juice. Then, your server brings out large platters of fluffy pancakes, sausage, scrambled eggs, home-fried potatoes and biscuits and gravy. Orange juice, coffee, hot tea and milk are included in the price of your meal. If you want a different beverage, such as soda or iced tea, you pay your waiter or waitress. There are also mimosas, bloody Mary’s and other brunch-type beverages available for an extra charge, too. The hot and fresh donuts delivered to your table. The pancakes were super fluffy and served with syrup. Our first round of food came out a bit cool but our second helpings came out piping hot and still steaming. Based on the family-style service, most items seem to be prepared in advance and could stay under heat lamps until servers grab them. So freshness depends on when you ask for seconds, or thirds, or fourths… The sausage was no better than some pre-packaged frozen varieties and the scrambled eggs were just average. The potatoes were a home run with a nice crunchy exterior but a creamy inside. The biscuits and gravy were a bit disappointing. A lukewarm gravy smothered the biscuit and didn’t have much flavor. Biscuits and gravy, pancake, home fried potatoes, sausage and scrambled eggs make up the lumberjack-style breakfast. For just under $10, it’s easy to overlook some of Paul Bunyan’s shortcomings. What they lack in taste and quality, they make up for in ambience and experience. It’s a great place for families and large groups. Even our group of three adults had fun. You sit close to the people next to you and can easily make out their conversations so if you want a bit more privacy when you dine, this probably isn’t the restaurant for you. Also, we’re still not sure if the restaurant takes credit cards. There are strategically-placed ATMs in the queue area and we didn’t see anyone paying with credit cards or notice any machines at the register area. So, come prepared with some extra cash just in case. 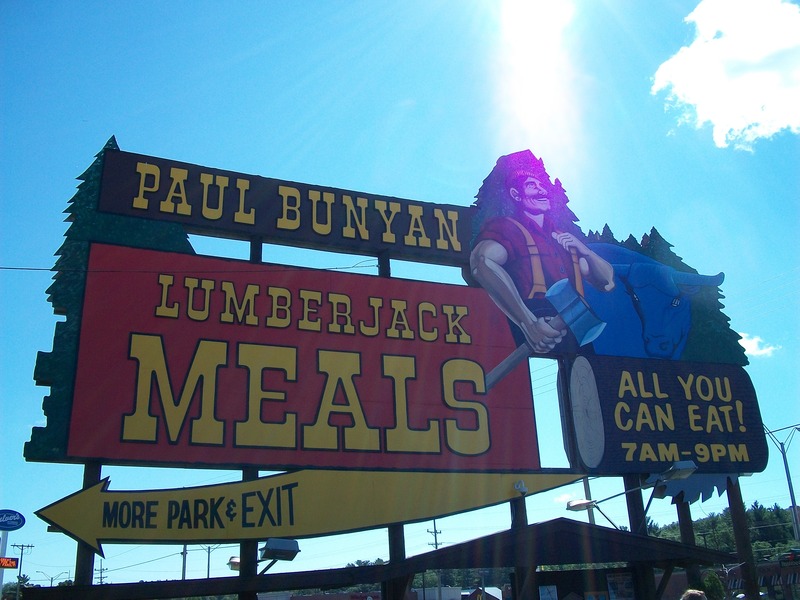 Paul Bunyan’s also has a second location in northern Wisconsin in Minocqua. 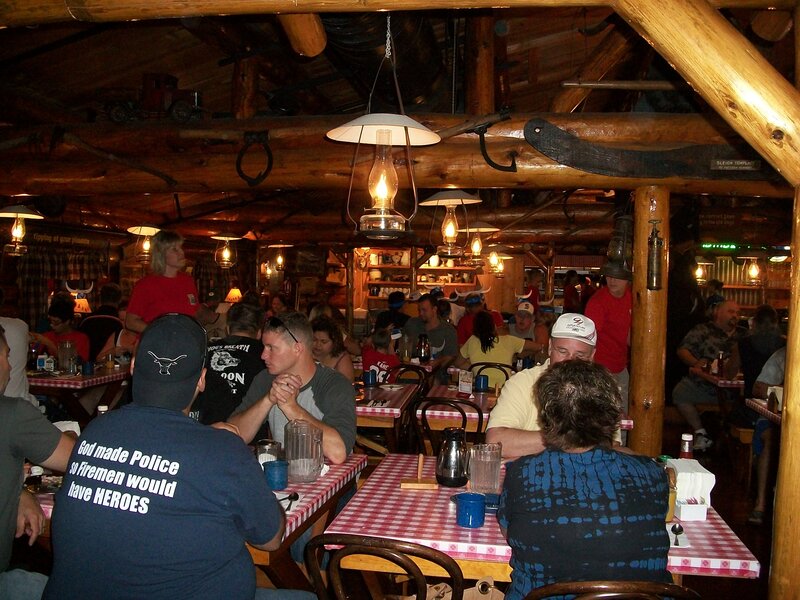 The main dining area at Paul Bunyan's Cook Shanty in Wisconsin Dells. It may be 20 years since my last stop at Paul Bunyan’s Cook Shanty, but I’m sure this will be one of those places that I’ll be taking my kids to in the future. It’s the things you remember and look back on and say, “Hey, wasn’t that fun when…?” I like those moments. They’re peaceful and easygoing and take me back to a simpler time. Check out this video of Paul Bunyan’s in Wisconsin Dells from one of the Madison-area TV stations. 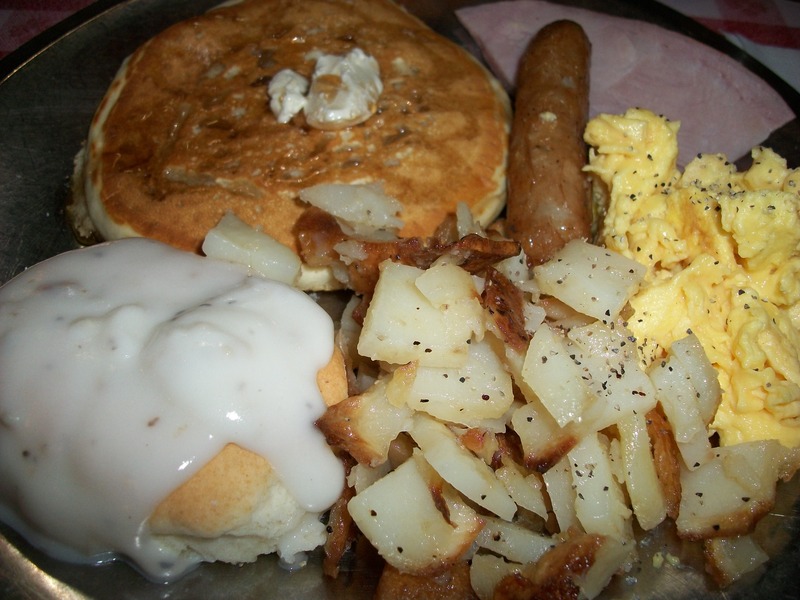 This entry was posted in Foodie Destination and tagged Babe, biscuits, breakfast, eggs, gravy, lumberjack, Minocqua, ox, pancakes, Paul Bunyan's Cook Shanty, Ripley's Believe It or Not, sausage, Wisconsin Dells by Christina. Bookmark the permalink. We were there in the ’70s. All I can remember were the fabulous donuts.